Platform rentals in Las Vegas are one of the options you have at your disposal when hosting a speaking engagement. The platform choices you make can give a speaker the tools needed to succeed and can help ensure a great audience experience. Some of the crucial decisions you’ll make center on platform height and dimensions and the overall relationship between a speaker and the people watching him or her. Be mindful that a speaker is a storyteller that must work the room. The dimensions you choose should be relative to the overall room as well as the positioning of audience sections. If there are two or more sections, the speaker can’t simply focus on one and ignore the other. Therefore, the speaker needs enough room to move back and forth as well as handle any props that will be used. Platform height is also an important consideration, and that choice should also be made relative to the room and audience. You don’t want a speaker looming over those in the front row, but the platform must be high enough that the view isn’t obstructed for the back row. Note that platform risers are an option if you need to elevate a platform even more. 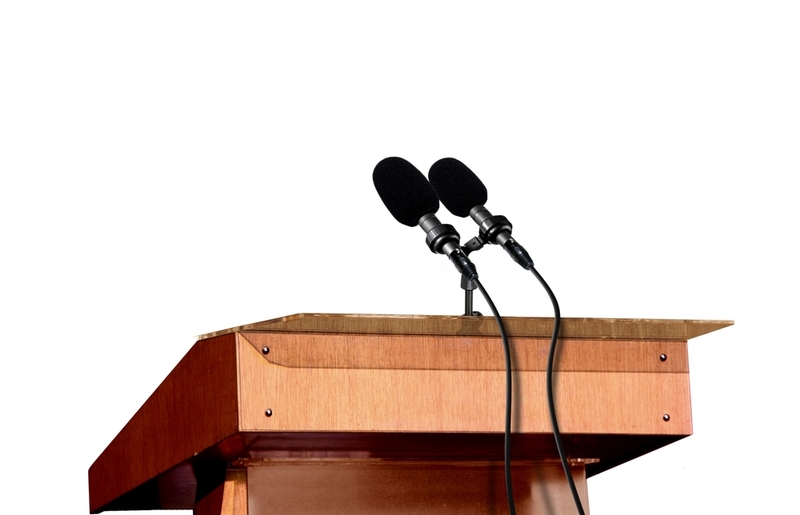 Podiums should not be so tall that they obstruct the speaker or distract the audience. Chest level is a good rule of thumb. If you don’t know the height of your speaker or have to account for multiple speakers, then an adjustable podium is a good choice. Rails and similar safety features are an option. You should generally consider them if your platform is more than a few feet off the floor. Even if your podium has plenty of clearance, an active speaker may approach the edge as he or she engages the audience.